If you ever waited a table at NF this is a familiar view. Looking from the wait station into the kitchen. Plates of chicken fried steak, Farmers Platters, and Traveler's Farm Plates crossed from the cook out to the tables of hungry people. Just put the ticket up and give it a spin. Wait station mess. Milk machine on left with exit door just ahead. Someone took the paneling off the wall (don't know why) so you can see the insulation. As a po' kid, I never got to go in, just pass it traveling between Tucson/Phoenix.Like Eddie Murphy said "I got McDonalds you ain't got none"!I had "Mama Burgers". By the time I had my own car/money it was closed. Bummer Dude! I've stopped in recent years to photograph, but never inside. Nice to see inside too bad it has not been repurposed. I remember Nickerson Farms on I-44 in Missouri. So long ago. I hate seeing neat places fade away. I wish somebody cared enough to revive it. Glad there are folks that post pics like you have done. Thanks. After driving past this thing at Picacho Peak for decades, finally stopped and got a close up look & some pictures...I had no idea what it was all about and wish I had stopped and experienced it when it was open. Clever home-made mini-steam locomotive next to the parking lot and the world's largest wood pole (seems like 100 feet, but probably more like 50) with a rotating red beacon (long dark) on top. Unfortunately I get the feeling that it will never operate again despite the core structure being not all that bad. The new travel plaza on the other side of the freeway is more visible and appears more accesible and seems to be doing well. NF is up on top of a hill and the path there isn't intuitively obvious so it probably put a lot of people off. I may return and screw up a bit more courage...maybe step three steps inside the open doorways (two or three on the south side) to get clearer pics. The "trading post" on the N side of the property has been burned to the ground as well as one of the double-wides that used to be just to the west. There remains a closed but intact C-Store nearby, as well as a single-wide that is starting its rapid descent to unrecoverability...windows getting broken, most loose things stolen, etc., etc. Too bad we can't have places like Bodie anymore; when I first visited in 1961, not a soul lived there but it was untouched, with inventory still in the stores from its 1932 abandonment. At least I got to see the best example! I'm so glad others are interested in this kind of stuff. Anyway, there is an old NF and Stuckeys in High Hill MO. The NF is boarded up, but you can actually get inside the Stuckeys. So Sad. I have some good pics of Stuckeys. Across the street from them is an old abandoned gas station that you can go into also. When we went to Tucson we stopped (always) at Picacho. The food was good but as a child I LOVED that beehive at the register. It was soooo cool. I went into this Nickersons Farms but it appears all boarded up now. I took the No Trespassing sign that has "Nickerson Farms" written on it using some pliers. It's big and bulky but AWESOME! Almost got bit by a rattlesnake or snakes when I was inside the kitchen area. 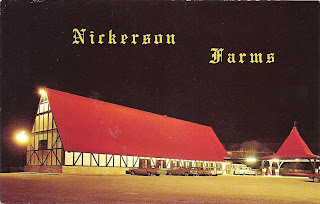 Wish the place could be opened again as a Nickerson Farms. I worked here 1976 to 1978! Does anyone know what those cage like structures are from just before nf? I can take find anything on them. In so glad to find something on nf though :) I love this kind of stuff. Kind of sad though to see great places get forgotten about. I'm amazed at all the people going in an taking things that don't belong to them. Though abandoned, I've passed this particular one in AZ several times, it just seems wrong to take what isn't yours. The person who took the No Trespassing sign oughta be ashamed of himself. There's a fully intact one on I-29 just north of Omaha as well. Where can I forward a photo to? I wonder who I can talk to about this place in AZ, because I would love to buy in if I can!?!? And of course the property too! Can anyone help me out? Building was torn down last month. The roof had collapsed and it became a hazard. The sign still remains. Someone had to pay to tear it down. I'm guessing it was the closest city or the county?